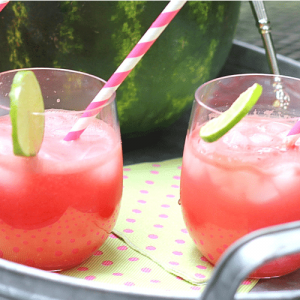 This easy watermelon punch recipe is a refreshing way to enjoy the summer. Make this drink even more fun to serve by turning the watermelon you used to make the drink into a fun serving bowl! Cut the top of the watermelon off about 1/6 of the way down. Cut the bottom end enough to make sure the watermelon will stand on it's own. Scoop out flesh and place in a blender. Process until smooth. Strain through a fine-mesh strainer; discard solids. Return watermelon to the blender. Add lemonade concentrate and pineapple juice and blend well. Served chilled over crushed ice. To make sure all ingredients are combined, give the punch a little stir before you enjoy it.